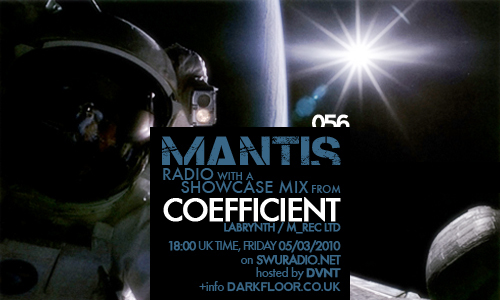 As Mantis Radio approaches its big 6-0 we’ve London’s Coefficient in for a session. Hear tracks from Alix Perez, Biome, Dead Sound, Mazzula, Jammer, Zed Bias. Coefficient is a mysterious London producer and DJ. He has had releases on Labrynth of Portugal and the Italian M_Rec Ltd. What little details there are surrounding Coefficient amount to: that he began the project in 2006 and with michaelangelo of Labrynth produces as Telesthesia (exclusively vinyl only released offbeat techno); and that he describes his music as being dark, hypnotic, industrial and experimental techno.